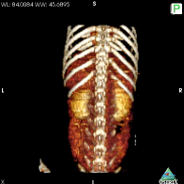 Computed Tomography (CT or CAT) is a noninvasive diagnostic imaging procedure that uses a combination of X-ray and computer technology to produce cross-sectional images (often called slices) of the body, making the images much more detailed than X-rays or even ultrasound. 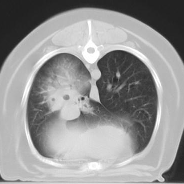 A CT scan shows highly detailed images of any part of the body but is best for the bones, nose, ears, GI, and lungs. Contrast CT is useful for assessing the urinary tract. 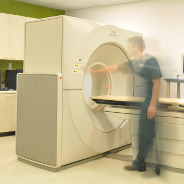 CT studies also have the added advantage of speed—the entire scan can often be completed in minutes. Furthermore, the images can easily be used to create 2-D and 3-D reconstructions.